Description: Loosely tufted perennial to 1 m high; nodes 2–4, glabrous, usually subtended by a ring of glands. 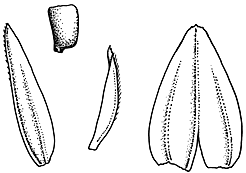 Leaves with margins of lower sheaths sometimes with hairs to 0.5 mm long; orifice sometimes with scattered hairs to 1 mm long; ligule a ciliate rim with hairs < 0.5 mm long; blade rolled or flat, to 2 mm wide, smooth. Inflorescence open, 4–40 cm long, 2–10 cm wide; rachis smooth, glabrous; pedicels 2–7 mm long, smooth, glabrous, often with ring of glands 0.5–1 mm below glumes. Spikelets 3–8 mm long, to 1.5 mm wide, florets 4–12; rachilla usually persistent with lemmas deciduous, paleas subpersistent. Glumes acute, smooth, glabrous, keel sometimes scabrous; lower glume 0.5–1 mm long, upper 1–1.5 mm long. Lemmas 1.5–2 mm long, acute, smooth, glabrous; keel scabrous. Palea slightly shorter than lemma. Distribution and occurrence: Grows in woodland and native pasture.